Spring is almost here and Animal Planet would like to celebrate by offering one lucky reader a package of Animal Planet Hatch Ems Super Grow Eggs for the perfect Easter giveaway. The colorful animals hatch right out of their shells and are available in Safari Animals, Rain Forest Animals, Sea Creatures and Dinosaur series to take kids on a tour of some of the world’s most historic and exotic animals. Each series contains three eggs and fun animal fact cards about each animal to allow children to learn as they play. 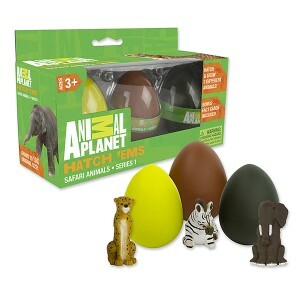 I was sent the Animal Planet Hatch Ems Safari Animal Eggs. These are the perfect eggs to place in an Easter basket or hide on Easter Sunday! Kids will love watching them hatch and anxiously await to see what animal they get! These magical eggs really hatch! Simply place them in water and within 24 hours, they will start to crack. Soon thereafter, within 36-48 hours, will pop out a special growing pet. This set included an African Elephant, Cheetah and Plains Zebra. DIRECTIONS FOR USE: Place Eggs in water. Within 24-36 hours your egg will begin to crack. Each day, replace water. The pet will continue to grow, out of its shell. You may help the pet out, but it will keep growing up to 5-10x its size with or without your help. When the pet hatches, rinse the pet off as it will be slippery, and either play with it, or place it back in clean water and watch it daily continue to grow. 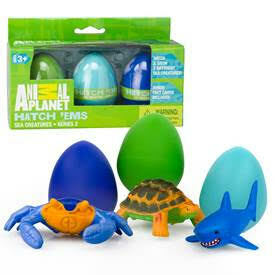 Animal Planet Hatch Ems Super Grow Eggs are available for purchase for $11.99 by visiting scsdirectinc.com,hatchems.com and specialty retailers nationwide.